In the throes of True Grit fever John Wayne’s estate has just inked a deal with powerHouse to publish the first-ever authorized John Wayne photo book for release this fall. Combining never-before-seen photographs culled from the family’s vast personal archives with images from some of The Duke’s 175 feature films, the book (as yet untitled) will be a must. Hopefully this will help Wayne, a true Hollywood icon of the old school, get some of the style cred he deserves. 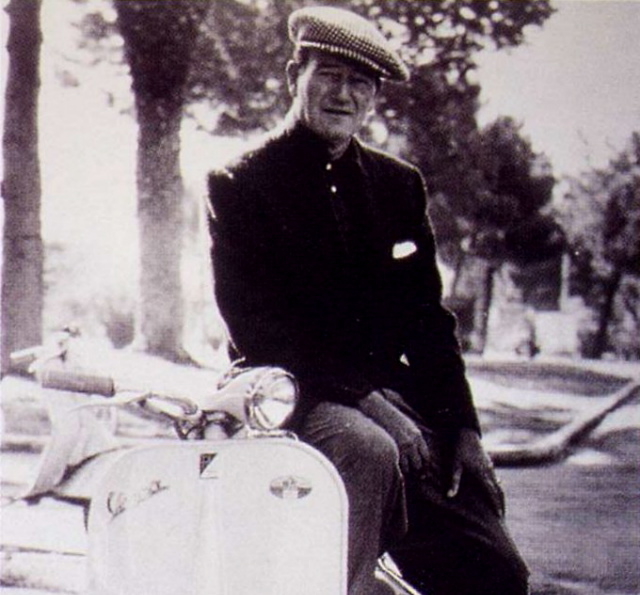 Just check out his dashing Vespa riding ensemble. This entry was posted in Icons, Style and tagged books, Fall 2011, Gary Cooper, Hollywood, John Wayne, powerHouse, smoking, True Grit, Vespa. Bookmark the permalink.